"Victora & Abdul is a lovely, heartwarming film featuring two wonderful lead performances"
The British royals and Queen Victoria herself have been portrayed onscreen countless times so it is a surprise that there are many stories still to be told. I had never heard of Abdul Karim and his fascinating relationship with the monarch in the later years of her life so I am grateful to Victoria & Abdul for shedding light on this particular story. The movie begins in 1887 in Agra, India, where Abdul (Ali Fazal) works as a clerk in prison. Because of his good-looking appearance and tall frame, he is bestowed the honour of heading to England with Mohammed (Adeel Akhtar) to present Victoria with a ceremonial coin. He doesn’t stick to protocol and the Queen ends up quite fascinated with him and assigns him the role of footman, but as their bond strengthens, he becomes her Urdu teacher and spiritual guide, also known as a “Munshi”. Their friendship doesn’t go down well with the Royal Household, led by Sir Henry (the late Tim Pigott-Smith) and her son Bertie (Eddie Izzard), as they consider it inappropriate and are put out by Abdul being treated better than them and they keep trying to find ways to break up the friendship and send Abdul back to India. Stephen Frears (Philomena, Florence Foster Jenkins) has created a movie that is far more comedic than expected and made me laugh regularly. It makes sense to tackle it in this way rather than a straightforward drama because their friendship was unusual and the reaction to it is quite hilarious. It takes a more dramatic turn in the last third and this is where it loses a bit of momentum. This section could have been trimmed down because, although parts were still very funny (such as the royal doctor inspecting Abdul’s nether regions), it felt quite repetitive as it is about members of the Royal Household trying to kick him out repeatedly and Victoria refusing every time. This is where the movie started to drag a little bit because it had become quite serious – she was seriously ill and they are threatening to declare her insane for wanting to give Abdul a knighthood – and so when it becomes sad at the very end, it didn’t affect me emotionally as much as it possibly could have done if the running time had been reduced a fraction. It is still very moving, of course, but not the tearjerker it could have become. 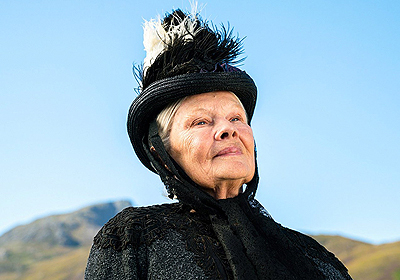 The performances are excellent too – Dench is perfect as this cantankerous old woman who won’t listen to anybody. She looks thoroughly exhausted before Abdul shows up and puts a smile on her face and a spring in her step. Fazal is also a wonderful addition and plays Karim with such charming sincerity. Victoria & Abdul is a lovely, heartwarming film featuring two wonderful lead performances.